New construction is happening all over Chiang Mai. In our neighborhood by Wat Jet Yod, numerous buildings of various sizes have sprung from once grassy lots. It not hard to imagine that in a few years time, all of the free space will be home to solidly build brick and concrete mixed use buildings. Construction sites in our neighborhood are more informal than in America. Rarely is there a fence blocking the view, and since the buildings are so close to the road it’s easy to watch them getting made. There are a few distinct phases. 1) A beautiful grassy lot sits vacant for a while; its only occupants are butterflies. 2) Trucks start parking in the lot, but otherwise nothing is changed. 3) Somehow the lot turns into a big festering mess of mud before the foundation is laid. 4) Like ants, a swarm of workers in goulashes and stray hats starts laying brick and concrete. Concrete is elevated by ropes and buckets, bricks are elevated by being thrown. It’s a circus-like and crazy scene. This stage is surprisingly quick. Walking by the construction site daily, it’s easy to see progress. After missing a week, the progress is even more shocking. How such a seemingly disorganized effort can produce such a solid building so quickly is a mystery. 5) Once the guts are complete, the construction appears slower. The workers are now hidden in the interior. The building’s finishing touches and landscaping come last and languidly. Living in the shadows of the construction or in a field nearby are the workers. These depressing little village-like areas are comprised of shacks cobbled together from spare boards and corrugated metal. Kids and chickens wander around. The ground is muddy. The people don’t smile back, instead they look at the passerby with aprehension. When I first saw them, I thought it was odd that such poor Thai people could be living next to the middle class. But in a talk with a Thai friend, she revealed that they weren’t Thai at all. They were from Myanmar(Burma). And most likely, they were working illegally. But she wasn’t shocked by this. Much like illegal Mexicans in the U.S., these Burmese are not only tolerated but needed for the economy to function. It’s estimated that there are tens of thousands of illegal immigrants working in all sorts of industries from agriculture to maid service. And as to be expected, they get paid squat and generally work under far worse conditions than a Thai would. It’s too bad prosperous countries work this way. The people being tread on are of great importance but they have no power to get fair treatment. The situation doesn’t remind me at all of the fable of Chicken Licken. In it, Chicken Licken eats lunch one day and believes the sky is falling down because an acorn falls on her head. She decides to tell the King, and on her journey meets other animals who join her in the quest. Those animals were named Henny Penny, Cocky Lockey and Goosey Loosey. Finally, they come across Foxy Loxy, a fox who offers the chicken and her friends his help. There are a variety of endings, but the morals of the story are “don’t be a chicken” and “don’t believe everything you hear.” In either case, it has nothing to do with illegal Burmese in Thailand. 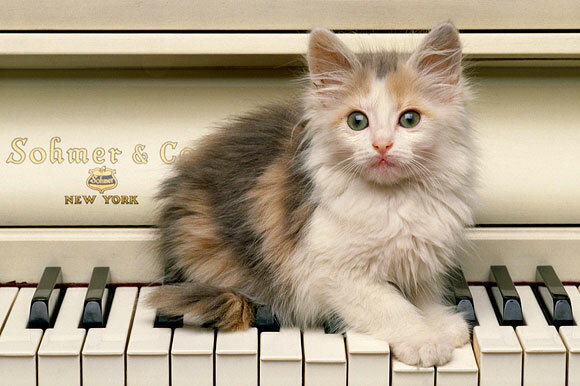 Unrelated kitten on a piano. I feel sad for the Burmese who have constructed the nice building I’m sleeping in. They’ve likely harvested the rice and plucked the fruit that I slurp into my already full belly. Until recently, I didn’t even realize their sacrifices. It feels different here. Driving by the beautiful rice fields brings up mixed thoughts. Yes, they belong to Thailand and produce some fragrant jasmine rice. But who is that bent over in the field doing all the work? For an insightful read about illegal Burmese workers in Thailand, check out this Amnesty International article.